2012 was a momentous year for 3D printing, bringing us all a lot closer to the day we’ll see one of these machines in every home. Last year I wrote about the state of 3D printing software, likening it to the mid 1990’s days of unfriendly graphics program user interfaces like Debabblizer and GifBuilder. Since then a lot has happened. The future where non technically savvy users like my mom will be able to 3D print by themselves is in sight. To start the year, I backed Brook Drumm’s Printrbot highly successful campaign on Kickstarter- he raised over $830,000 in 30 days! I hoped to get my printer by March, but he originally had planned to make around 50 machines, not over 1000. Immediately in January, Makerbot switched from selling build it yourself kits to selling the Replicator- a preassembled, calibrated and tested machine that could print from an SD card without being tethered to a computer. In June, after months of kickimg myself for not buying the Replicator, I finally received my Printrbot+ and was able to dive in. 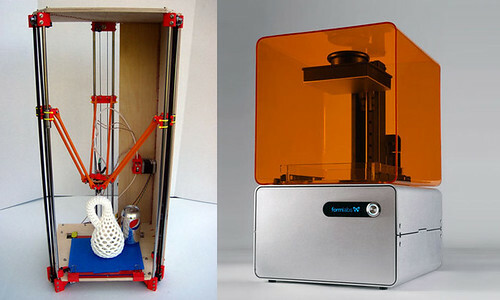 Then, over the summer of 2012 something remarkable happened… The usability of 3D printing software started to catch up! Previously, after creating a model I wanted to print on my Printrbot (using 3D authoring packages like SketchUp or Blender), I had to use Slic3r to slice the model into printable layers, generating a GCode file- the machine print instructions. I then used another program Pronterface to load the GCode and control the printer during the print. The prints can take hours- my longest print to date took over 24 hours! Mid summer 2012, the open source community came through with Repetier, which integrates slicing and printer controls in one interface. It was a huge improvement! The program has a 3d model view that shows a model before its sliced and previews the actual GCode paths in 3d space after slicing. As a print starts, the program monitors temperatures and its possible to tweak the feed rate of the filament (the “ink” of 3D Printing). The interface is still complex and requires a lot of technical knowledge about the printing process to use, but the integration of external slicing programs into the print interface was a huge step forward! In all fairness, Makerbot users only had to deal with one program- ReplicatorG to do all this, but Makerbot also made some huge user experience leaps forward in the fall of 2012 by releasing their next gen machine the Replicator 2 and a whole new software package- Makerware. At long last we have the sense that non technical users like my mom could be comfortable using a 3D printer. 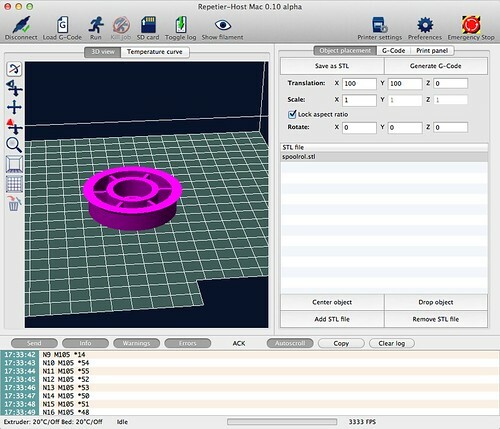 The clean and simple interface allows users to quickly add models to a print plate and send it to the printer. However, Makerbot also ruffled some feathers in the open source community. Previously, all the company’s hardware and software had been released as open source projects, but Makerware was proprietary software, and although elements of the Replicator2 are open source, the machine itself was not. IMHO, the situation was not handled as well as it could have been and its not as big a deal as some have made about it. I’m sure that CEO Bre Pettis was freaked out at the prospects of Replicator knockoffs coming out of China at half the price of his machines (In August, there was a Kickstarter campaign for the “Tangibot”- an exact Replicator clone, but the fact that the campaign failed was also hailed as a huge win for open source- Read Wired’s commentary on this here). I really respect the work that Makerbot has done to improve the quality and speed of 3D printing and want to see them succeed. This year they definitely took some notes from Steve Jobs and Apple in making a cohesive ecosystem of integrated software and hardware. IMO, this is a smart move, although they might have handled going closed source a little better. I also wish they stayed in the kit making world as well, but I respect the vision of making a high end dependable machine. If I had the cash, I would definitely be buying their upcoming Replicator 2X machine but with kids in college, $2,800 is a little rich for my budget. 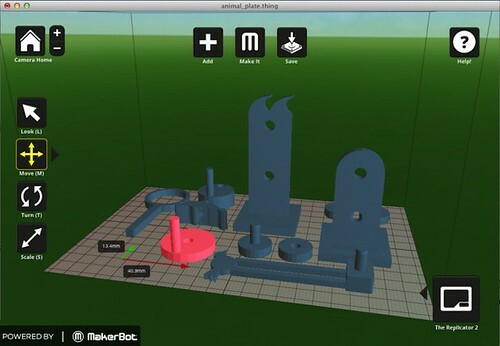 I can imagine a future where their file sharing community site Thingiverse seamlessly integrates with their hardware and sends sliced files directly to your Replicator’s print queue- How cool would that be? Another huge event milestone in 3D Printing this year was the Form 1 Kickstater Campaign which raised almost 3 million dollars. Unlike Reprap based Fused Deposition Modeling (FDM) machines which print by building up layers of melted plastic, the Form 1 uses Stereolithography: a technique of hardening liquid resins by exposing them to lasers. The Form 1 promises much higher resolution than FDM machines, bringing 3D printing to Jewlers and Engineeers of precision parts. However, 3D Systems– one of the “old guard” players in the 3D community sued both Kickstarter and Form 1, claiming that the machine infroinged upon patents. The fact that the lawsuit named Kickstarter in addition to Form 1 was an important aspect in the case, and angered many in the DIY community. Its a really exciting time for 3D Printing. Machines with integrated scanners even showed up, turning them into 3D photocopiers. Advances are being made in conductive inks, allowing for the creation of printable circuits. The technology is also being embraced by all sorts of industries, most notably construction and medicine. The real revolution will be in the way that manufacturing is being brought to the masses in the same way that desktop publishing did in the early 90’s. Wired’s senior editor Chris Anderson even quit his job, exclaiming that 3D printing will be “bigger than the web”. We’re probably still a few years off from seeing one of these in every home, but that day could be coming sooner than you think. This entry was posted in 3D Printing and tagged 3D Printing, 3D Scanning. Bookmark the permalink.